Kathleen Robison is an award-winning impressionist painter based out of Orange County. she enjoys painting en plein air alla prima—that is, painted outdoors in a single sitting. What follows is an interview exploring some of the challenges and pleasures of working en plein air. Have you always worked primarily en plein air, or did you start as a studio artist? When I started painting again twenty years ago, I only painted outside on location—en plein air. After six years, I started to create large paintings in the studio using these small studies from outside and photos as reference and inspiration. Painting in the studio gives you more time to render and make the final product look how you envision it. Painting en plein air is always a fun challenge because you must get the gist of the scene down before the sun’s movement changes the light and shadow. Usually, you have less than three hours to do this. Have you always worked primarily with oil, or have you worked heavily with other mediums, such as watercolor or acrylic? My main medium is oil. In college, when I got my BFA, I used all mediums, including watercolor, acrylic, pastel, air bush, and 3D design. What are some of the greatest challenges when working en plein air? My greatest challenge working in plein air is the weather: It’s hard to predict. Even seemingly great weather can be tricky. A beautiful, sunny day at any location can end up being very windy, so you have to weigh down your easel. Or you can start in a nice quiet place, but then a construction crew comes along and starts jackhammering beside you, so there are challenges because you can’t really control the environment, but it’s always fun to work through it and come out with a finished piece. Another challenge in working on location is you can have a perfectly sunny day and then the clouds may come by and cover the sun, and your whole scene changes because the shadows are gone, the light is gone and now you have more of a gray scene. You have to learn to paint very quickly when you’re on location and mostly get the gist of the scene—capturing sunlight and atmosphere, or on a cloudy day getting the correct Grays down. You seem to work with a variety of landscapes: many California coastal scenes, as well as depictions of greenery and hills. Does each landscape require a different approach, or do you have one overriding philosophy that can be applied to each landscape? No matter what the subject is, I usually approach my paintings in the same way. First, I find a subject that interests me and inspires me. Second, I sketch the scene briefly and work out the composition and values. Third, I always start with all the darks and shadows, and then I put in the actual color which is called local color. Finally, I use the highlight color for the brightest brights. I put in these large shapes and puzzle pieces, then I go back in and do detailed work. Are there any locations that you would like to paint but have not yet been able to? I would love to go back to France and paint the lavender fields. I went there when I was in my twenties, but I was not an actual painter then and didn’t do the kind of impressionist landscape painting I do today. So, although I have a lot of photos that I have used to paint lavender fields, I would love to go back there and paint in the villages and countryside. But my most favorite thing to paint now is just day-to-day life. I love painting all along the California coast. I also love painting people in quiet little scenes and seeing how the light hits them, and I like to turn these into simple, beautiful portraits. Ultimately, I think there’s beauty everywhere, so I don’t need to travel far to get a gorgeous scene. Do you have a favorite time of day for painting en plein air? My favorite time to paint is early morning, ideally before ten, but I try to at least get started before ten because there are usually good light and shadow. I also love painting sunsets and at dusk when the sun’s going down. 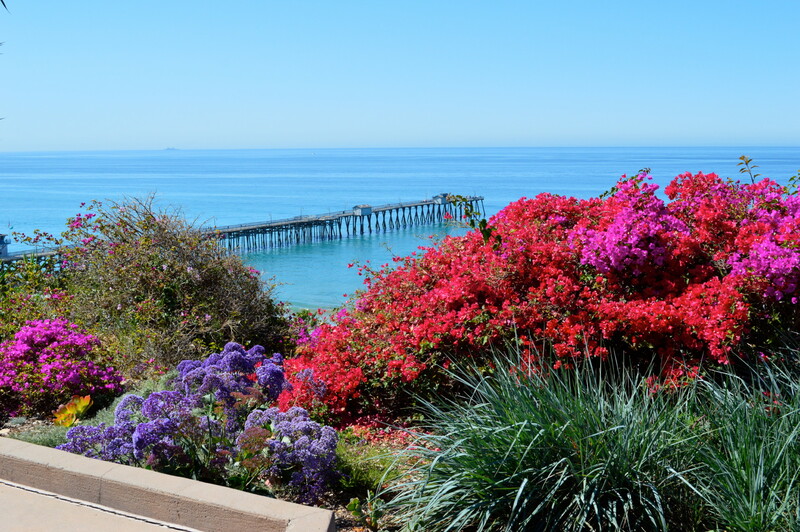 All information from this website, artwork, photos of artwork, including text, photos and descriptions are the property of individual artists and or San Clemente Art Association and are protected under U.S. copyright laws. No portion of art or works or statements may be duplicated, downloaded, reproduced or altered in any way without prior explicit permission.